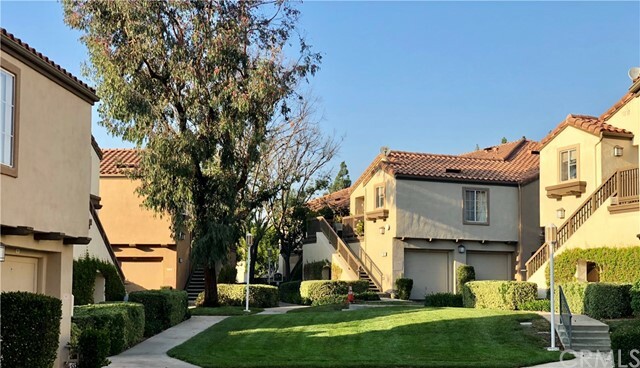 Located in desirable canyon hills estates community in orange, near the prestigious santiago charter school district, this beautifully maintained cozy lower unit charming condo boasts a bright and open floor plan filled with abundant natural light. Remodeled designer kitchen has been upgraded with custom cabinets, stainless steel appliances, granite/quartz counter tops and recessed lighting, with a breakfast bar and well-designed living room with ceiling fan and large windows that provide abundant natural light. This warm and inviting home is set with natural tones and large windows in both the living and bedroom areas. The addition of recessed lighting makes it beautifully bright. The master bedroom has a large walk-in closet. Inside laundry with washer and dryer included. Detached garage with lots of storage space. Outside patio provides a private area for entertaining and bbqâ€™s. Additional features include upgraded fixtures in the bathroom, newer plumbing and water heater. Enjoy all the resort-like amenities this community has to offer, including swimming pools, spas, fitness center, a playground area, and a wonderful clubhouse for friends and family. Transportation, shopping, and dining are all nearby and recreational opportunities abound in peterâ€™s canyon regional park, providing endless trails for hiking, running, cycling and horseback riding! For more information or make an appointment to see property ID PW18294086.